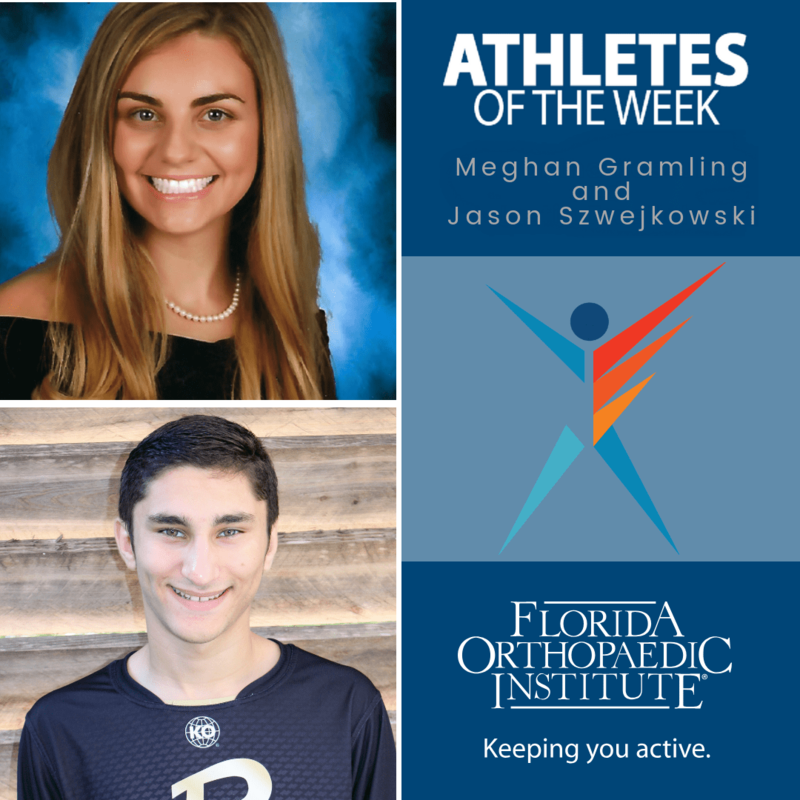 Tampa, FL – Feb. 26, 2019 – Florida Orthopaedic Institute (FOI) is excited to announce Meghan Gramling and Jason Szwejkowski from Plant High School as the ‘Athletes of the Week’ for the week ending February 22, 2019. Pam Gassler, Girls’ Varsity Tennis Coach, nominated Gramling to be an Athlete of the Week for her commitment and selflessness towards her teammates. Amongst all the obstacles that face her, Gramling continues to make leaps and bounds in pursuit of her goals. Szwejkowski was nominated by the Wrestling Head Coach, Jeremy Carter, for his relentless effort and passion for improvement of not only himself, but of those around him. Szwejkowski knows exactly what is required to give it his all, despite any setbacks. Gramling and Szwejkowski both boast throwing yourself in, getting involved and listening as keys to future success. Team Player: Athletes who are nominated for excellence in team play are chosen by a coach who feels the athlete does his or her best to put direction into action, makes a significant contribution to the team and continuously works to improve his or her skills, attitude and training. To view last week’s award winners, please follow this link. Founded in 1989, Florida Orthopaedic Institute is Florida’s largest orthopedic group and provides expertise and treatment of orthopedic-related injuries and conditions, including adult reconstruction and arthritis, chiropractic services, foot and ankle, general orthopedics, hand and wrist, interventional spine, musculoskeletal oncology, orthopedic trauma, physical medicine and rehabilitation, physical and occupational therapy, sports medicine, shoulder and elbow, spine and chiropractic services, among others. The organization treats patients throughout its surgery centers in North Tampa and Citrus Park, two orthopaedic urgent care centers in South Tampa and Brandon, and 9 office locations in Bloomingdale, Brandon, Citrus Park, North Tampa, Northdale, Palm Harbor, South Tampa, Sun City Center and Wesley Chapel. For more information, please visit: FloridaOrtho.com and ‘like’ us on Facebook: facebook.com/Florida.Orthopaedic.Institute.